Sometimes the pathway to adopting a new pet can take an unexpected detour. We start thinking our perfect pet is the one we have carefully picked out from the internet, only to realise after a little research that the perfect pet for us might be something completely different. From our Adopted & Adored letter box this week, we have a heart-warming update from Helen, who, after a little guidance, found her perfect match in eight-year-old Staffy cross, Bella. My name is Helen, and I just wanted to send an update about a dog I adopted from your North Melbourne shelter a couple of years ago. On the 13th of October, 2012, my sister and I went to the shelter to check out a Rottweiler named Lincoln. He was handsome and big, and what I thought I was looking for. Then, I started talking to a handler, who suggested that based on my space size, that I should reconsider Lincoln, and take a look at Bella, who I hadn’t even noticed. Bella was curled up in her bed, quietly watching the world go past from underneath her eyelashes, not moving, just watching, while all of the dogs in the other pens jumped and barked and made as much noise as possible to get attention from passing humans. I asked what Bella’s story was, and I remember the exact moment when I realised she was mine; the handler said “she’s a perfectly good dog, she’s just depressed”. I asked to spend some time with Bella, who after coming out of her pen, just sort of hung around, nuzzling myself and my sister for pats, but otherwise, not making much of a fuss. When it was time to return her to her pen, I remember watching a handler walk her back to the cages, and just as she was approaching her row, she dug her heels in, and refused to walk, and had to be carried into her cage, and my heart broke for her a bit. That day, I put Bella on hold, cancelled the plans I had previously made with my sister, and went shopping for pet care goods. 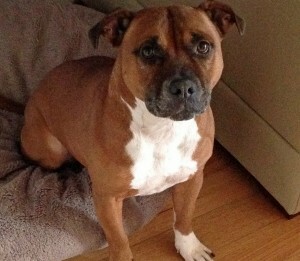 The next day, I returned to the North Melbourne shelter and collected Bella. Before I met with the vet nurse, another handler pulled me aside and checked that I had all of the necessary items for Bella. When I said that I did, he crouched down next to Bella, patted her, and quietly spoke to her for a few seconds. I don’t know what he said, but I feel like Bella meant something to him. As we left, another handler said that she was sad to see Bella go, as the handlers used to like to spend time with Bella at the end of their shift. I was advised at the time that Bella suffers from a flea allergy that causes dermatitis. In an odd way, this worked perfectly for me, as I am typically precious about parasites on my pets. 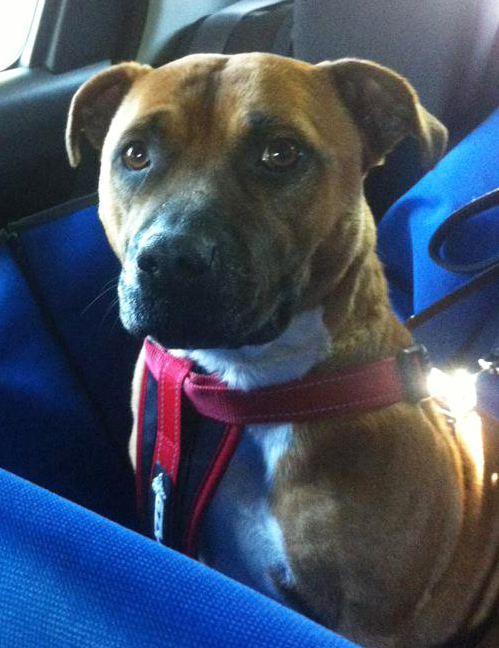 Bella hopped into the back of my car, and quietly travelled with me into our new life together. Today, Bella is very spoilt. At night, I can hear her snoring outside my bedroom door, where she likes to sleep until the early hours, before returning to her bed. She wins over my friends and strangers with her sweet face and gentle demeanour, and she brightens my days with her limitless enthusiasm and trust that no matter what happens, it’s all ok, as long as she’s with her people. It’s like having a sweet, dorky little sister that hangs around my ankles all day, wondering what I’m doing, if I need any help, and if she can be part of the fun. So, in short, thank you for introducing me to my absolute delight of a dog. Bella’s a bit goofy and scrappy, but she is the sweetest, gentlest dog I have ever met, and easily the best dog I have ever cared for. I’m so fortunate to have found her and have her in my life.